Summary: A small business requires a proper plan, adequate funds, and whole lot of drive. One of the more underrated business ventures that entrepreneurs are looking into is the furniture industry. However, if you lack the necessary funds to start your store and continue operations, you’ll be trapped in a downward financial spiral. Keep in mind that there are numerous aspects that you must consider such as labor, rent, and the size of your store. Are you looking to sell used or new furniture? This is an important factor to consider as it will have an enormous impact on your funds. Obviously, new furniture costs much more to purchase than used furniture, even after the costs of repairing the use items. So, before you jump right into the business, be sure that you understand the costs of selling one over the other. Note that used furniture prices can be negotiated when purchased, while brand new furniture doesn’t allow for any wiggle room whatsoever. Whether you’re looking at furniture that has flexible polyurethane foam or ones that have memory foam, it doesn’t matter if you’re unable to afford it. The size of your store will determine the amount of start-up funds you need. The larger the store, the more money it will demand. To keep your funds low at the beginning, start small and then expand as you make consistent sales. Remember, the more buildings that you lease, the more rent you’ll have to pay – and you can’t expect to realistically hit a certain sales number each and every month consistently. You must always have an appropriate amount of funds or you’ll be run out of the business pretty quickly. To keep up with the constant demands of selling and shipping furniture, you’ll require a sizable workforce – depending on the size of your store. Determine the number of employees that you’ll need and begin allocating pay rates for each position that you’re looking to hire. Now, it’s important to remember that labor costs are indeed difficult for a new business owner to predict because the number of employees that you’re going to hire must correlate to the relative success of your business – and when you’re just starting, everything’s up in the air. Having a lack of funds is a common problem for many small business owners. In the beginning, you might struggle to sell your products until you start making a name for yourself. To prevent yourself from running out of money, give yourself three to six months of funds to meet your expenses without making one sale. This way, you’ll be prepared to meet all financial expectations without relying on paying your bills with every sale. 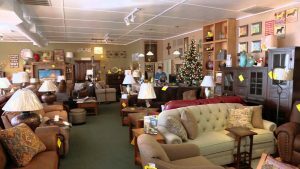 Foam Factory, Inc., a foam specialty store, can help you find the right pieces you need to compliment all of your furniture products.